FFWPU South Africa, Rev. 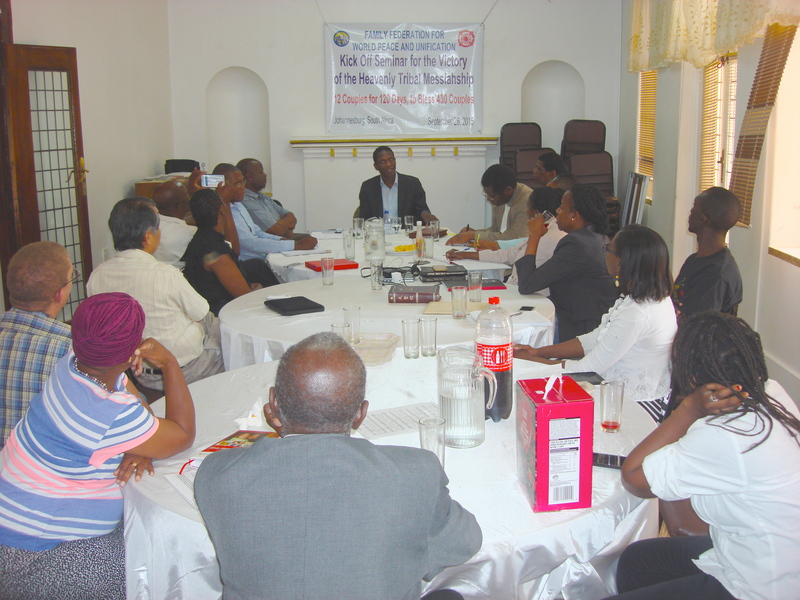 Jean Augustin Ghomsi, September 26, 2015: We acknowledge the presence of National Leaders of Swaziland (Rev. Jean Mensah Noumonvi) and Lesotho (Rev. Darkwell Sakala), the Vice-National Leader of Mozambique (Ms. Esperanza Sumbane) as well as the Vice-National Leader of Swaziland (Ms Sabina Makhanya) and the Head of the Financial Department of Mozambique. The workshop started with Hoon Dok Hwe (CIG CSG pp. 1264-1270 on The Background and the Proclamation of Cheon Il Guk and some quotes from the Special Lecture of the Leaders Assembly on Meaning of the 3rd Seonghwa Memorial of True Father and the True Parents’ Accomplishments after Foundation Day). Rev. Camara insisted on the need to “Forgive, Love and Unite” and fulfill the ideal of Cheon Il Guk where we unite our mind and body, unite husband and wife, parents and children, brothers and sisters, Cain and Abel, etc. The Regional President shared how he pledged to True Mother to encourage the Blessed families of East Africa to become Heavenly Tribal Messiahs and work towards fulfilling the blessing of their 430 couples as soon as possible. He said, “I promised to work particularly in South Africa, Zambia and Kenya to make sure at least 12 couples in each of the countries bless their 430 couples by February 2016.” He asked all the National Leaders and Vice-National Leaders to make sure that they find 12 couples in their respective country to be actively involved in the blessing 430 couples by February 2016. He tried to convey True Mother’s heart and wishes for the vision 2020. We had a joint Sunday Service where the different National Leaders testified to the Tribal Messiah activities in their countries. Rev. Zenele Kunene reported about the 3rd Seonghwa Anniversary Celebration and the Special Leaders’ Assembly. Rev. Camara also reported about the Special Leaders’ Assembly and explained True Parents’ wish for at least 7 nations to become Cheon Il Guk nations by 2020. He said True Mother said it could only be done through successful Tribal Messiahship activities. He shared how True Mother has taken upon herself to mourn True Father the last three years on behalf of all humanity. “All we need now is to accomplish our responsibility by being successful Heavenly Tribal Messiahs.” He gave the example of the National Leader of Rwanda who is getting some substantial success in the Tribal Messiahship and the National Leader of Kenya who went to his village and could meet a lady who welcomed him and gave him a land to build a church and died praying. The Governor of the region came by helicopter and also contributed in raising $7,000 for the building of the new church. He also shared his activities in Kenya and Uganda after Korea. Through his inspiration, brothers and sisters contributed respectively $7000 and $13,050. He encouraged those in attendance to also live for the sake of others and to contribute financially to church activities. By the end of the service $8000 were pledged.